Installing a porch enclosure is a perfect way to increase living space and enhance the overall enjoyment you get from your home. At ABC Seamless, we offer a wide selection of products that can turn your patio into a beautiful outdoor living space that you and your family will enjoy for years to come. We are not a one-size-fits-all sunroom construction company. Instead, we will assess your unique tastes in style as well as your budget and then provide a customized solution that is perfect for you and your home. No matter which type of porch enclosure you choose, you can rest assured that it will be built to stand the test of time. The materials we use are highly durable and resist warping, fading, and cracking, and require little maintenance. So, when you choose ABC Seamless for a porch enclosure or any of our other products, including roof shingles, residential siding, soffit and fascia, windows, and more, you can be confident you’re investing in upgrades that will remain beautiful for years to come and add lasting value to your home. Our commitment to offering products of outstanding quality, as well as our dedication to superior craftsmanship, has helped us to earn an A+ rating from the Better Business Bureau and a Top 200 Exterior Contractor ranking from Qualified Remodeler. 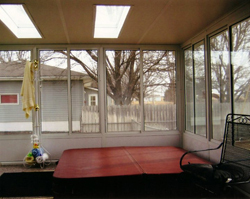 For more information about adding a porch enclosure to your home in Omaha, La Vista, Grand Island, or elsewhere in Central Nebraska, please contact us today. We’ll be glad to answer any questions you may have and provide a free quote.